Open Educational Resources (OER) provide teachers, learners, and others with legal permissions to engage in the 5R activities. Combine the original or revised content with other material to create something new (e.g., incorporate the content into a mashup). Share copies of the original content, your revisions, or your remixes with others (e.g., give a copy of the content to a friend). 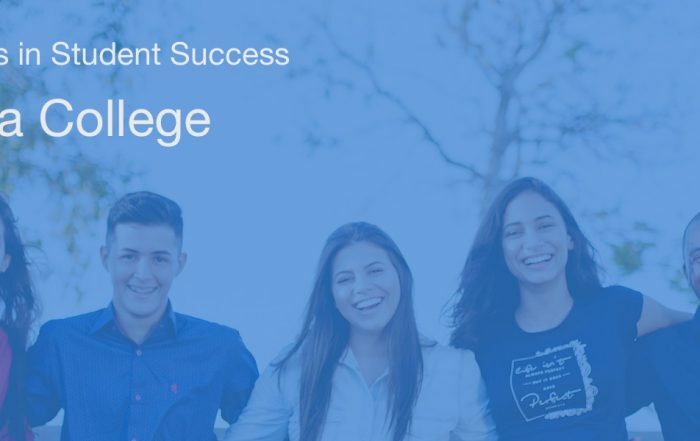 Improve student success while saving students money. In eleven separate research studies published in peer-reviewed journals, which include over 48,000 college and university students, 93% of students whose faculty assigned OER in place of commercial textbooks received final course grades that were the same or higher than control students using commercial textbooks (1). Create reliable savings students can count on. When individual faculty replace commercial textbooks with OER, students get a nice surprise. When an entire degree program replaces commercial textbooks with OER, students get a predictable decrease in the cost to graduate that they can factor into their financial planning. Increase academic freedom for faculty. Open educational resources give faculty the legal permissions necessary to personalize teaching and learning materials for their students, or have students personalize them for themselves, or for each other – opening the door to a wide array of teaching and learning activities that are simply not possible with commercial curriculum. Make your program more attractive to potential students. After Tidewater Community College launched its Z-Degree initiative in fall 2013, it was 20% cheaper to graduate from the Z-Business Administration program compared to students who started with the traditional business program in fall 2012. These savings add up to thousands for every student who completes the OER program. That’s a marketing message that resonates with students who are shopping for the best value. Speed students through your program. 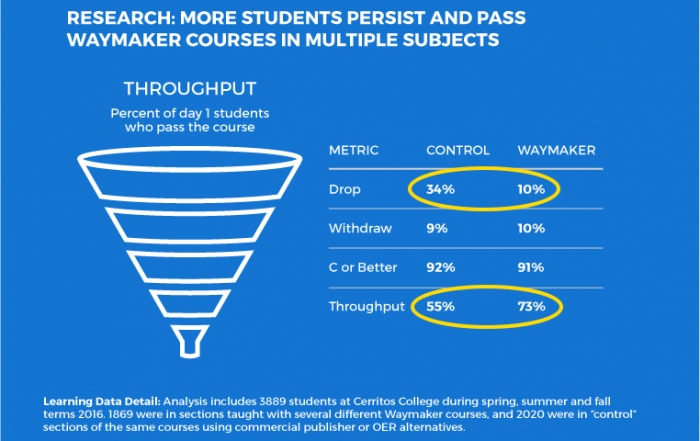 Initial research studies indicate that students whose faculty assign OER in place of commercial textbooks drop their courses at lower rates (2), keeping them on track to graduate. These students also reinvest the money they saved not buying textbooks in taking additional credits (3), helping them move through their programs faster. When students stay in class rather than dropping, institutions hold on to tuition revenue they would have otherwise refunded to students. When students reinvest money they would have spent on textbooks to take additional credits, institutions receive net new revenue. And when students move steadily toward graduation, schools that receive formula funding see an additional positive financial impact. How Do We Engage with Institutions? With significant prior experience helping institutions and state systems launch OER degree programs, Lumen Learning is a preferred support partner for developing OER degree programs that impact student success. 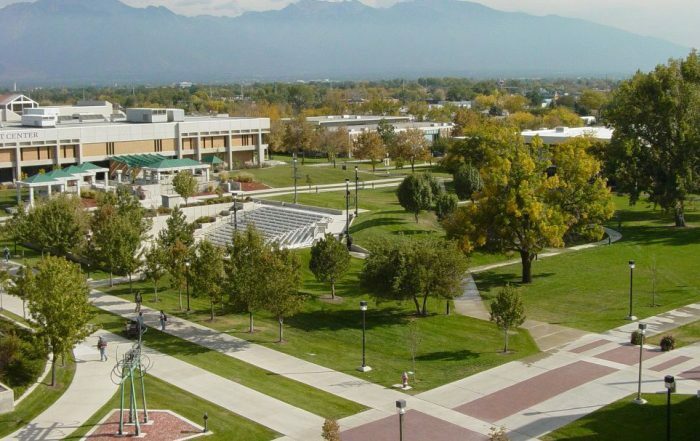 Contact us to discuss your goals and any questions you may have about OER degree programs. Strategy and Planning: We provide guidance around how to approach OER degree programs academically and administratively, as well as planning for strong alignment with institutional goals and priorities. Training: We train administrators and faculty around the transition to open educational resources, best practices in OER-based course design and pedagogy, and how to support the success of a complete zero textbook cost degree program. Courseware: We provide a complete course structure designed using OER. Then we support faculty as they customize courses to fit their learning outcomes, instructional approach and degree program requirements. Course Design: For high-enrollment courses that are not already part of Lumen’s course catalog, we can work collaboratively with your faculty on OER discovery, instructional design, course-building and licensing review to create new courses designed using OER. Support: We provide guaranteed hosting and availability for all content and tools, LMS integration, and ongoing training and faculty support for instructors teaching with OER. Analytics: We conduct efficacy testing along with content and learning analytics to measure how students are performing and guide faculty to improve and augment course content to strengthen student learning. Continuous improvement: We evaluate student outcomes and incorporate data-driven improvements to strengthen student learning and program sustainability. Community: You become part of a growing community of educators and institutions engaged in using OER to improve affordability, access and student success.